"Some people in the bnha fandom seem to believe this, but I haven’t seen any masterposts on it. So here I’ve put together all of the evidence that other fans have pointed out along with some of my own observations. 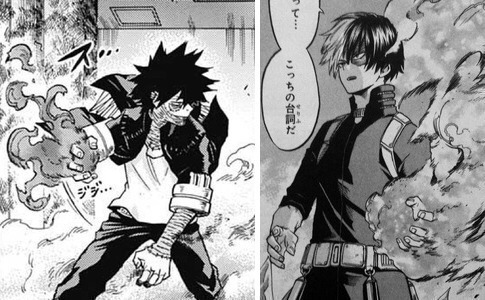 It’s known that Shouto has 2 older brothers who were deemed “failures” by Endeavor. Given Endeavor’s parenting and how there has been domestic abuse in the household, it wouldn’t be too surprising if one of them ran away from home and became a villain. 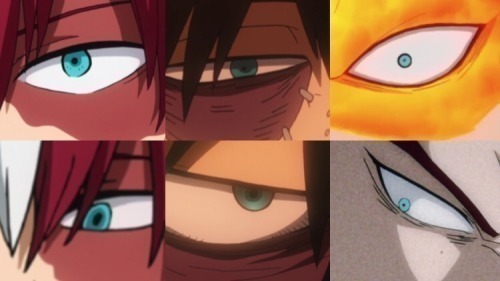 Dabi has the same eye color as Shouto’s left eye and his sister. His hair style looks similar to young Endeavor’s. Dabi is still the only villain whose name hasn’t been revealed. From the beginning, he insisted on going by the alias “Dabi” even when Tomura asked for his real name. He’d want to do this if he comes from a high profile family or has a famous dad like Endeavor, and he doesn’t want to be associated with them. In ch. 88 even when the identities of all the other villains were announced by Gran Torino, Dabi’s was not, because GT had knocked him out in the previous chapter. In retrospect, with the way this whole ambush was set up, the mangaka could’ve wanted to prevent Dabi and Endeavor from meeting, and thus prevent Dabi’s identity from being revealed. That would make sense since this arc is supposed to focus on AFO, All Might, etc so having the big reveal now wouldn’t be appropriate. In ch. 87, Dabi was knocked out the moment he tried to use his flames - this prevented him from setting the whole place on fire and drawing attention to himself. And shortly afterward in the same chapter, Endeavor complains about being kept outside for the entire mission. Finally, remember that Dabi had said he’ll reveal his name when he needs to, which means this was not the right time to reveal it. Anyway his real name must be pretty darn important since the mangaka went out of his way to keep it hidden. One last thing: now with All Might’s state as of ch. 95 and what we saw of Endeavor’s reaction to it, what if Endeavor plays a greater role in the next arc or the one after… that could mean in the near future Dabi’s identity may finally be revealed? 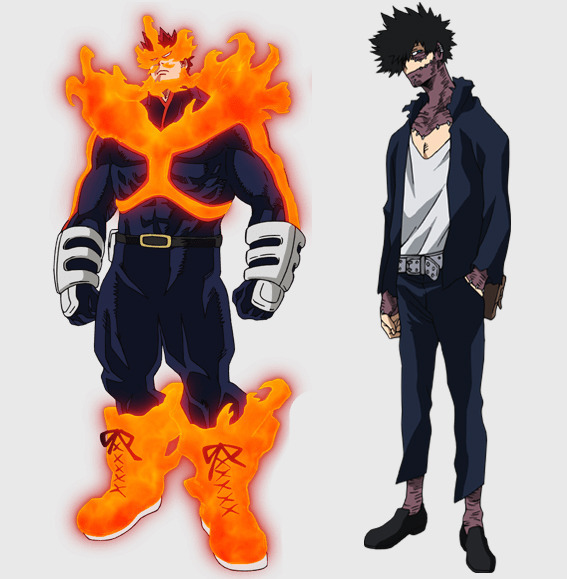 (I hope)"
i just think that it’s important to note the correlation between endeavor and dabi’s quirks, in that Endeavor’s is called the Hell Flame, and Dabi’s was originally supposed to be called Demon Flame and then it was changed to Cremation. 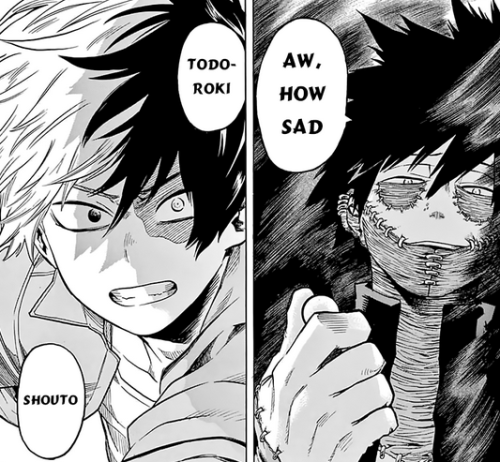 look at the places where Endeavors flames are ignited and then at Dabi´s scars.
. It´s nearly the same places. Also based on one smash panel (I couldn´t find it right now. I´m really sorry for that) his scars go only up to his knees. " You know what I just realized… if the Dabi Todoroki theory is true… then Dabi is the only child who got ALL of Endeavor’s looks. He got the red hair, the eyes, the quirk- everything. He looked like Endeavor the most out of all the kids- even Shouto. And yeah that’s obvious lol but like,,, imagine what that must mean for his relationship with his mom. Imagine how hard it must have been for her to be in the same room as the kid who looks like Endeavor, How fear must have entered her eyes for a split second every time she saw him. And as she grew worse she probably couldn’t even stand to look at him or be in the same room, and the older he got the more he looked like Endeavor, and he probably noticed. How could you NOT notice, and at first he must have been so confused, scared he did something wrong, and goes out of his way to try and make it right, only to notice it’s getting worse. Imagine the crushing realization he must of had when he realized his mother didn’t like him, that his mother was scared of him. 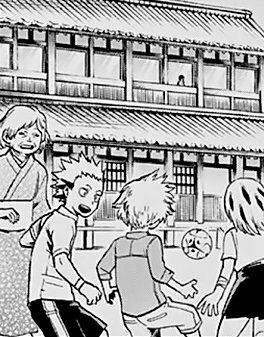 We know she was close to Shouto, and even tho we don’t know her relationship with the other kids I would assume that she would be closer to the ones who didn’t remind her of Endeavor. And a little kid would notice that. What if he grew to hate his looks. The looks that made his mother hate him. And that’s what made him change his hair color and scar his face and body. It’s just a theory ofc but like, if Dabi is a Todoroki his relationship with his mom would be VERY strained. 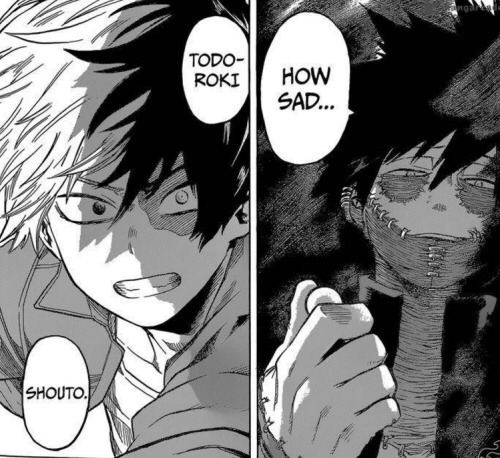 Dabi’s quirk allows him to control a dark flame. Dabi uses his power very similarly to the way that Shōto uses his, shown here. As we saw in the anime, Endeavor has the ability to control the temperature (changing the color) of the flame he produces. This could explain the darker color of Dabi’s fire. Or, perhaps his quirk is just a variation of his father’s. In the manga, when it shows Shōto’s three other siblings, all of them have white hair (minus small flakes of red here and there). When this scene was animated, the middle child’s white hair was changed to red. It’s pretty apparent that white hair = ice-related power, and red hair = fire-related power. 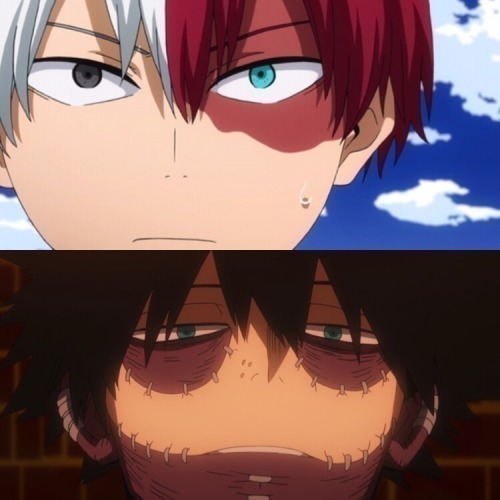 Why would the animators feel the need to change the middle boy’s hair color if the fact that he had a fire quirk, not an ice quirk, was irrelevant? 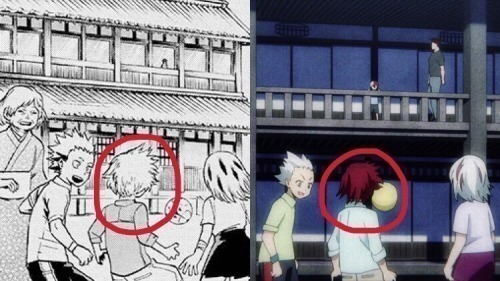 This was most likely a correction, since a young, fire-quirked Dabi would have had red hair, not white. Not to mention this kid’s hair just… looks a lot like Dabi’s. The teal/sea green/blue eyes that run on Endeavor’s side of the family seems to be unique to the Todoroki family in this series. Endeavor’s eyes are both this color, and Shōto’s left eye is this color. While it was hard to tell the exact shade of blue prior to animation, as seen in the anime, Dabi’s eyes are the exact same color. He has Todoroki blue-green eyes. He simply goes by Dabi. He has another name, one that he doesn’t want to use and will only tell when he “needs to”. This implies that whatever his name is, it’s significant. Significant enough to not use, for whatever reason. The Todoroki name is famous. I mean, Endeavor’s the #2 (#1..) Hero. Plus, Todoroki Enji is an evil man, I wouldn’t want his name either. 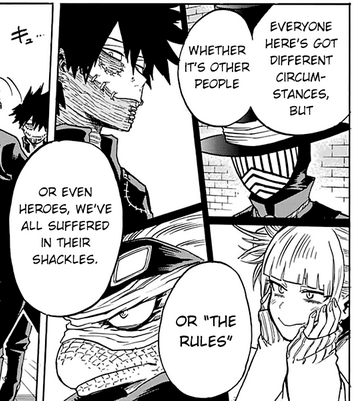 Maybe he’s waiting for the perfect time to expose him..
Dabi’s beliefs when it comes to heroes align with Stain’s: the current system is corrupt, the current heroes are fake, and there needs to be change. If he grew up in the Todoroki household, him having these ideas would make total sense in the context of the story. He doesn’t have them for no reason; he saw the reality of the current top hero first hand and built his ideals around it. Hair dye exists in this world, and it’s used by the characters. Kirishima has black hair, which he dyes red. Dabi could easily do the opposite of this- dye (or burn…?) his red hair black. 8. Where are the other Todoroki Children? We know Fuyumi and Shōto live at home. But the other two? We have no knowledge on them, but we know they exist. 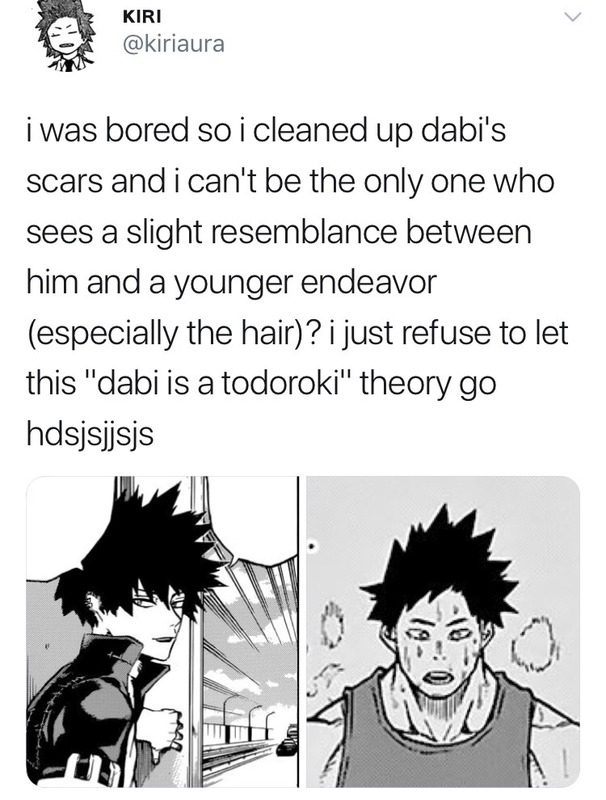 Those are the main reasons I think this Todoroki Dabi theory has taken off so much. With all of these points… It’s sort of a hard case to argue against. But anyway! Like I said, none of these points are unique. I just want to be able to reference them later. I’m not sure when my first part of the actual theories will come out, but I’m excited either way! I agree that he must be Endeavor's sun...but I don't think he is a son of Todoroki's mother. I believe he's a son from a previous relationship from Endeavor. Maybe even outside the a marriage. So, the only clue I'm ruling out from the ones you mentioned is the "the Todoroki brother """""looks"""" (he doesn't, c'mon, he's not even with his face bein shown) like Dabi". Also, the one mentioning Todoroki's mother's quirk. I agree that his burned skin must be related to the quirk, maybe even related to a lack of control by his part. I don't think he is his son because I doubt Endeavor would have illegitimate children. He could be his nephew however. I wouldn't put it past him. This is a dude who wanted to surpass All Might though any means necessary. He basically forced Shouto's mom to marry him just so he could sire a child to surpass All Might, going as far as to refer to Shouto's actual brother's as "things", most likely because they failed to meet his expectations. It wouldn't surprise me if he had attempted Quirk Marriage plan before and Dabi was the result, only for him to also be cast aside as a failure if he didn't meet the expectations right away. Quirk marriage was legal in the past though. I think the best approach for him was to find a woman with a Quirk he wanted and marry her. If he had married someone before Shouto's mother, he would have stayed with her. Obviously there is a tragic past we can add here, maybe his hypothetical his first wife died or something but what about the child? Endeavor would keep an eye on him, and I assume take care of him even if his Quirk is not suited. He is only harsh with Shouto because of his powers, the others live a normal life. Why would Endeavor want a child with fire and ice powers? Because the ice is a countermeasure to the fire. Why would he want a countermeasure? Because his first try was to get a child with a much stronger fire quirk, but it resulted in the child getting burned himself. That first child was Dabi. That's my thought on this matter. It probably was, but going by what Shouto said, it was still implied that Endeavor forced her into the union using his status. We honestly don't know if he would keep watch over the child. 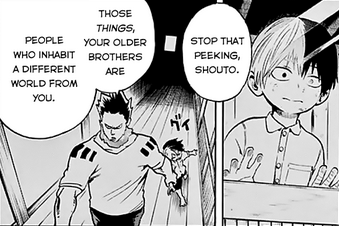 Shouto's siblings live normal lives because they aren't what he wanted, so he ignores them. I can see him casting aside a woman and child if the child was deemed a failure, and moving on to someone else that could give him what he wanted. Maybe he isn't that heartless, but given what I've seen from him, his obsession to beat All Might overtakes anything else, including the well being of his wife and children. Is it possible though? Quirks are mutations and evolve with age and Quirk strengthening. It'd mean that Dabi was born with a power too high for him at his young age. OFA is the only Quirk which can affect the user like that, and that's because the successors inherit the full power of the predecessor. I doubt he'd want a partner with a fire Quirk in the first place. Someone with another element like electricity or ice like his current wife would be much better. I imagine Hell Flame is probably considered top class among fire Quirks, and his wife must have a similar Quirk of the ice variety. He attempted to have a composite of the two. It probably was, but going by what Shouto said, it was still implied that Endeavor forced her into the union using his status. Well, Quirk marriages are arranged so this is not surprising. We honestly don't know if he would keep watch over the child. Shouto's siblings live normal lives because they aren't what he wanted, so he ignores them. I can see him casting aside a woman and child if the child was deemed a failure, and moving on to someone else that could give him what he wanted. Maybe he isn't that heartless, but given what I've seen from him, his obsession to beat All Might overtakes anything else, including the well being of his wife and children. Yeah but if Dabi is his kid, since he is not with him it means he is not what he wanted either, right? I don't think he would change partner as long as she is alive, that's how he got Shouto. Assuming he is his child, it's possible that he left him to an orphanage like Nana after the death of his first wife. 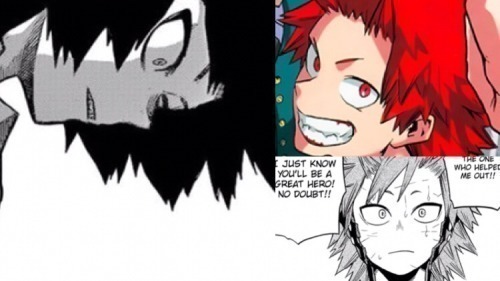 Kirishima's own quirk hurt him when he was a child, resulting in the scar above his eye. And i'm not sure how much stronger quirks like 13's Blackhole or Present Mic's Voice, which destroyed the ears of his parents and the doctors the moment he was born, can become. Even now Shindou's Shockwaves have a backlash on him, who knows how stronger that backlash was when he was 2 years old. Dabi being born with a Fire Quirk too hot to handle doesn't have to be impossible. Hell Fire + another Fire Quirk or Booster is all it'd take. Possible. Along with what ShenGao said, I was thinking of the possibility that Dabi's mother could have died due to complication in Dabi's birth due to his quirk. Maybe problem is harm to a target , not user ? It seems that Endeavor can control the temperature of his fire and his tactic is pretty much to cause heatstroke, and thus knockout the opponent without killing him or causing major burns (he's not always succeeds of course). 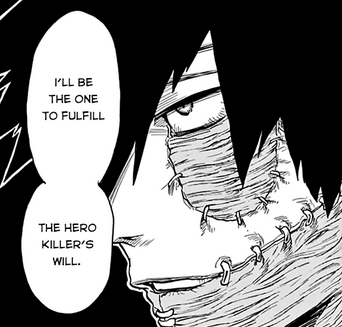 Dabi however burns down opponents to bones in seconds and unable to restrain the heat, not very useful quirk considering that main job of a hero is to capture a villain, not to kill or maim him. I am thinking a bit different,i was wonder why the older brother both of it gone from todoroki life and was it a misunderstanding what happen to todoroki mom? i mean if we look it back, why todoroki doesn't care he is missing both of his brother in first place and can't connect the dot when he see dabi in the first time? What happened actually? Is it todoroki developing dual personality that kill his own brother? Or actually both of his brother get in fight and killing each other creating dabi? But one thing for sure i really think the one who is alive is the first brother and the burned skin attaching to him is the second brother burned skin, his hairstyle is to act as he living as the second brother. Don't all the supporters of this theory think that they have different mothers? Dabi said his name but Todoroki is a celebrity and was on the list, it's not surprising. There are several fire type Quirks in the world as well. His two unnamed brothers have hair like Fuyumi, mostly white with some red. i think they have the same mother, if endeavor have two wife it's probably also become hot topic in search when he become 1st after all might retirement. There are several fire type Quirks in the world as well. His two unnamed brothers have hair like Fuyumi, mostly white with some red. Dabi could simply use hair paint, to mask his origin, burn scars can be fake as well, in theory at least. It's possible the fire has unique qualities that we haven't been able to see yet. 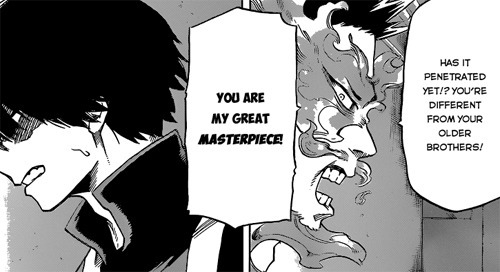 Aizawa wasn't aware that that Dabi was a clone, so he assumed Dabi's Quirk wasn't fire. Out of all the villains we've seen, Dabi is the only one that went "missing", or that is not anymore in contact with the Villains. Am I the only one finding this strange? I'm not a mangaka, but I like to write novels, and I know everything is done with a reason. We've seen him burning to death some people in an alley, and then - nothing. I think there must be a good reason behind this choice. 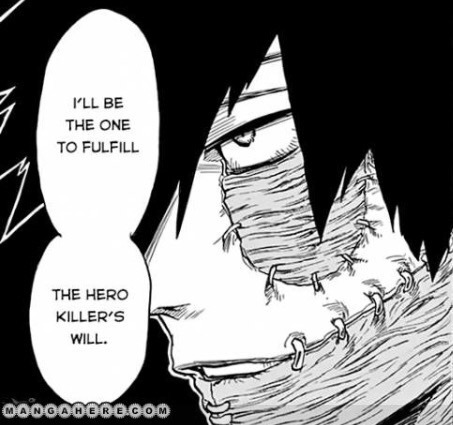 Is Dabi going to be a crucial character? an important villain?